The interior is quite traditional, though on the clean side for a trad-decor pub; it's not that the furnishings have been there for decades, more that refurbishment has been sensitive. The floor is covered with a patterned carpet that gives way to hardwood in a broad stripe around the bar, and the walls are covered with various sporting prints, old adverts, and things like that. There's a very squashy sofa just opposite the bar. The space is divided into a couple of different rooms, each with a slightly different feel. Kake first visited on a Wednesday afternoon in September 2009. When I arrived around 2:30pm there were a handful of other customers, but it was very quiet, no music and hardly any conversation. Six real ales were available, all from the Young's portfolio: Courage Best and Directors, Young's Special and Ordinary, Bombardier, and Kew Gold (£1.45/half). On my next visit, on a Thursday early evening in September 2010, there were quite a few people in at 6pm, though there were still plenty of free tables. Again no music, and a nice buzz of conversation. Clientele seemed rather more upmarket than in other pubs I've been in in the area. This time the ales on offer were Courage Best, St Austell Tribute (£3.20/pint), Young's Special and Ordinary, and Bombardier. According to the Young's website as of September 2010, food is served noon-2:30pm Mon-Wed, noon-2:30pm and 6:30pm-9:30pm Thu, noon-3pm and 6:30pm-9:30pm Fri, noon-3pm Sat, and noon-4pm Sun. 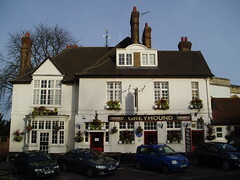 A sign seen in September 2009 advertised a quiz on Mondays from 9pm. Accessibility: A shallow step up to get in. Level access to the ladies' (at least one set - there are two). Last visited by Kake and Ewan, July 2013. Opening hours taken from the Young's website, September 2010. Last edited 2017-09-15 17:29:40 (version 19; diff). List all versions. Page last edited 2017-09-15 17:29:40 (version 19).